A former regional photographer has fulfilled a three decade-long dream of playing a pantomime dame. Len Copland, who was chief photographer at the Western Gazette, was made into an ugly sister ahead of a production of Cinderella at Yeovil’s Octagon Theatre. The transformation was undertaken by Matt Daines and Ian Smith, who play the ugly sisters Beatrice and Eugenie in the production. 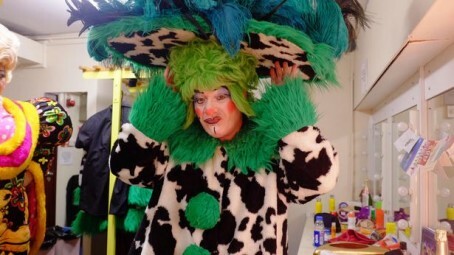 Lipstick, rouge and eye paint was applied to Len, as well as a costume and green wig. Len said: “I have wanted to do this for three decades and now my dream has been fulfilled. Mr Daines said: “It’s all about the character – the costumes and the wigs come second.